town; check out the listings with local realtors. Ukraina Park is also a great place to enjoy the outdoors. The park has three baseball diamonds, a playground, and sites for camping. EAT SHOP Mainstreet is the place to be! For all of your quilting supplies visit The Chicken Coop while on the Go East Quilting Tour (see ad on page 17). 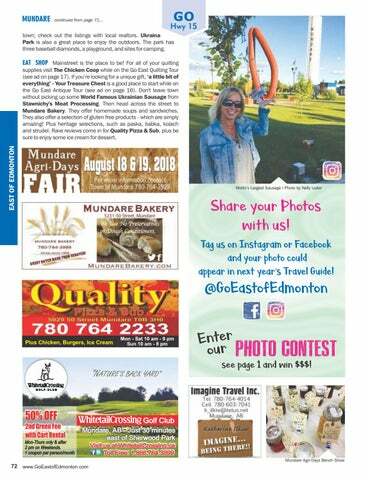 If you’re looking for a unique gift, ‘a little bit of everything’ - Your Treasure Chest is a good place to start while on the Go East Antique Tour (see ad on page 16). Don't leave town without picking up some World Famous Ukrainian Sausage from Stawnichy's Meat Processing. Then head across the street to Mundare Bakery. They offer homemade soups and sandwiches. They also offer a selection of gluten free products - which are simply amazing! Plus heritage selections, such as paska, babka, kolach and strudel. Rave reviews come in for Quality Pizza & Sub, plus be sure to enjoy some ice cream for dessert. Share your Photos with us! Tag us on Instagram or Facebook and your photo could appear in next year’s Travel Guide! Enterr ou Photo Contest see page 1 and win $$$!